To keep the pace, some operators are reaching back to the kitchen. Jeff Carcara, chief operating officer at Del Frisco’s Restaurant Group, recently told shareholders on a conference call that its Del Frisco’s Grille concept has begun reengineering parts of the menu and changing recipes to tighten up prep times and get food to guests sooner, quickening table turns. 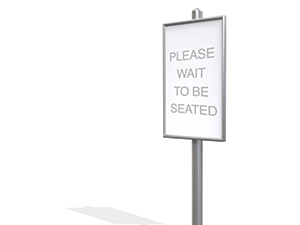 Others are tightening seating strategies and making sure guests are entertained while they wait. “Being happy and engaging is half the battle,” says Robin. Keep ’em close and caffeinated. “It’s our job to create an awesome environment that doesn’t feel like a 45-minute wait,” says Heather Beckman, general manager of Silver Grill Cafe in Fort Collins, Colo. By doubling the size of its patio and adding seating, blankets, a fire pit, cinnamon-roll samples and free coffee on weekends, the team created a comfortable, year-round space for waiting guests. Dickie Brennan’s restaurants in New Orleans have shaved upwards of 10 minutes off table turnovers by switching to a digital pay-at-the-table check presenter. “The system is intuitive, so we encourage servers to explain it briefly, then leave,” says Derek Nettles, director of IT for the group. Let them get in line from afar. Allowing parties to “park” until other members show means everybody else waits longer. It could be 20 minutes before they get there, Beckman notes. “In that time, we’ll have another group seated and eating. It’s a strategy that’s been extremely successful for us,” she says.